It’s hard to believe that we’re already into January – but with the Junior show behind us, I’m forced to believe us! Our Juniors did a beautiful job in December with their production of Christmas Around the World. The show was well-attended, and the audience was delighted with our young performers. Many commented that although the voices were a bit too quiet the first night, the kids made a leap in their projection for the second show, really responding to the feedback. That’s something that they can only really grasp the importance of through gaining that experience, and we were pleased to see the shift as they gained confidence and read their audience reactions better. 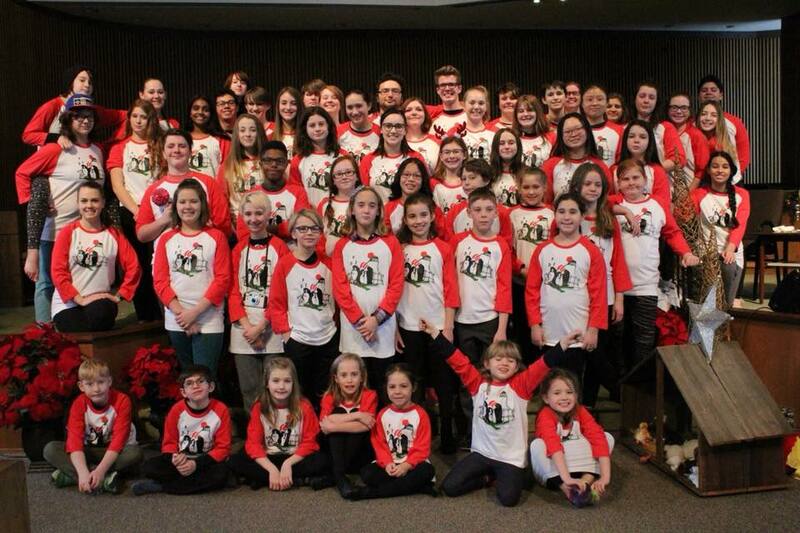 Just before going on with our Christmas Around the World, we were delighted to get our season tshirts in. Many thanks to Tribal Printing for assisting us with the production of our tshirts. We held another blind contest with student art for the shirts this year, asking the kids to incorporate elements of both our shows. Meredith Garswood was this year’s winner, and we went with a red and white shirt this year to highlight the Seuss-ness of it all! At that point, tshirts happily enjoyed, a potluck lunch at our last rehearsal, and a wonderful production down, everyone at RTC settled back for a much-needed break. At that point, I thought I was essentially done, but I had a few key emails that are worth noting. First of all, ridiculously early, we have sold out BOTH school shows for this year’s performances. Well, okay, we can probably squeeze one more class in for Anne of Green Gables, but no more. And Seussical’s school show is packed to the gills and we can’t take anyone else. We’re in negotiations to see if we’ll schedule another school performance for Seussical, but at this point it seems unlikely. There are plenty of seats available for public performances of both shows, however, and tickets are available from cast members or online HERE for Anne of Green Gables, and HERE, for Seussical. Second of all, we received word of renewed sponsorship from our friends at Uniform Local 200, for which we are most grateful, and a hint about a NEW sponsorship from Convergint Technologies, as well! At this point, we’re all happily engaged in working hard for the shows, which seem closer than ever. Anne of Green Gables opens in just another month and a half. Also coming up soon, we have our 3rd annual Pancake Fundraiser at Applebee’s (2250 Division Road) coming up on Saturday, January 27th between 8 a.m. and 10 a.m. All tickets must be purchased in advance from a cast or crew member; they are $14 each. Funds raised will go toward supporting our operational needs for our current season. Lastly – plans and research are underway for next season’s productions. We hope to be able to announce next season’s production schedule at the opening of Anne of Green Gables. Stay tuned! Next: Next post: Meet our Anne Shirleys!